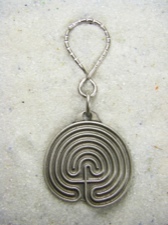 A Labyrinth is a symbol of the spiritual journey to the center. It is the outward sign of the inner pilgrimage. 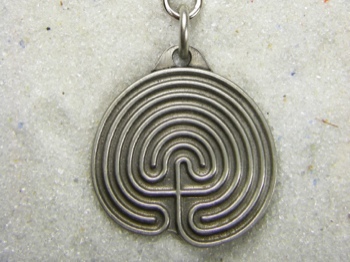 Walking a labyrinth - or tracing the pattern with your finger - brings a sense of peace and harmony, perhaps because you must focus on one step at a time and trust that the journey will always lead to your Center, even when it appears you are traveling in the opposite direction. This keychain is double-sided and 3 inches in length.